Describe your career path, including any professional experience before your graduate studies at DLSPH. 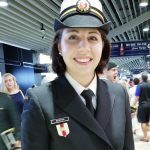 I joined the Canadian Armed Forces (CAF) as a sailor during my undergraduate degree. In 2014, I transitioned to my current trade as a Bioscience Officer, a support trade within the Health Services branch. My initial focus was in human factors and ergonomics, but I’ve recently moved to the School of Operational Medicine where I am the administrator for occupational and environmental medicine courses for CAF healthcare providers. On the civilian side I have an Honours Bachelor of Science in Biology from Nipissing University and a Certificate of Information Management from Dalhousie University. On the military side I have completed various courses focusing on occupational ergonomics, aerospace physiology, and Chemical, Biological, Radiological and Nuclear (CBRN) defence. Why did you choose to study public health? I changed trades with a very basic knowledge of what my occupation actually did – there’s less than 50 of us in the CAF and recruiting videos can only tell you so much. My first year involved an assortment of introductory courses from various other military occupations, from pilots to physicians. Some of these courses focused on CBRN defence and the various hazards and personal protection equipment required to operate in sub-optimal conditions. When I realized how excited I was by it all, I knew that public health would be a natural fit. How did you become interested in the field of Occupational and Environmental Health? Many of my earliest experiences in the CAF involved watching people injuring, or having the potential to injure, themselves. This wasn’t due to a lack of education, but could be chalked up to pure chance in an inherently risky occupation. The CAF exposes you to chaotic situations and sometimes people break. I wanted to minimize that risk as much as possible, and I felt that the MPH in OEH would help me achieve that goal. What impact do you hope to make on public health following your degree? My primary focus will always be members of the CAF. Following my degree I will belong to a team that ensures areas are safe for our members overseas. My future plans include getting involved with improving CAF internal public health policies, if possible.